One of the essential aims of the Stockholm Convention is to support the transition to safer alternatives. Some of the POPs targeted by the Stockholm Convention are already virtually obsolete. Their toxic effects became obvious early on and they have been banned or severely restricted in many countries for years or even decades. Replacement chemicals and techniques are in place. The remaining challenge is to find any leftover stocks and prevent them from being used. Some developing countries may need financial support to dispose of these stocks and replace them with chemicals whose benefits outweigh their risks. See information on exemptions related to PFOS, SCCPs and decaBDE. But with other POPs the transition to safer alternatives will require more effort. Alternatives may be more expensive and their manufacture and use more complicated. That could put developing countries in an awkward spot – struggling from day to day, the world’s poor tend to use what they can afford and what is available. Parties also need to make sure the alternatives do not have the same properties as the POPs they are replacing. Although it is difficult to fully evaluate potential risks of alternatives, the replacement of POPs should not result in creating another problem. So it is not enough for the Convention simply to say “NO” to its target list of POPs: it must also help governments find a way to say “Yes” to replacement solutions. The risk resulting from the use of the alternative is considerably lower than that resulting from the use of persistent organic pollutants, in view of its known hazardous properties and exposure conditions. POPs can be difficult to replace quickly. A number of countries have cited compelling reasons to use remaining stocks of linden for control of head lice and scabies. Recycling products that may contain brominated flame retardants and handling of wastes that may contain POPs in furans and dioxins – which after all are unintentional and unwanted – as much as feasible using current technologies. Fortunately, all of these challenges can be met through win-win solutions that reconcile eventual elimination with immediate human needs. By signaling to governments and industry that certain chemicals have no future and at the same time respecting their legitimate short-term concerns, the Convention will stimulate the discovery of new, cheap and effective alternatives to the world’s most dangerous POPs. A number of alternatives to POPs were mentioned by Parties and observers. 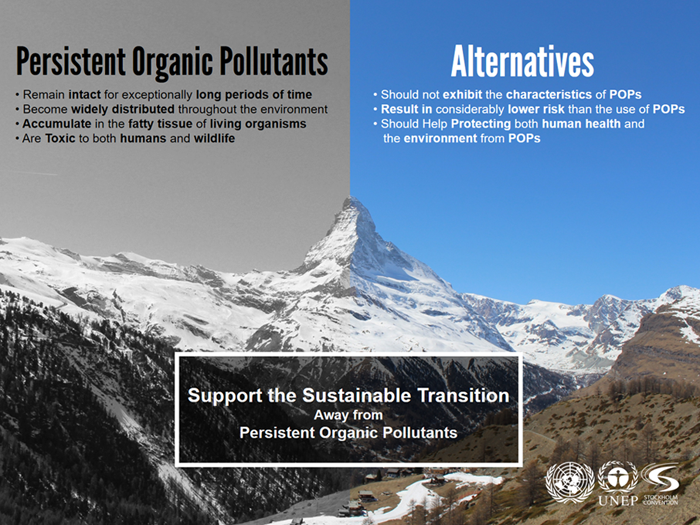 A screening assessment has been undertaken by the intersessional working group according to the guidance on considerations related to alternatives and substitutes for listed persistent organic pollutants and candidate chemicals (UNEP/POPS/POPRC.5/10/Add.1).